I am developing a Marketplace. How to implement MANGOPAY? This document specifies the workflow and basic functionalities used by marketplaces to process payments with MANGOPAY’s API. For specific needs, please contact our team. USER Natural person (natural user) or a legal person (legal user). SELLER User selling a product or a service. BUYER User buying a product or a service. E-WALLET Digital wallet on which electronic money is stored. PAYIN Deposit of funds by a user on an e-wallet. TRANSFER Movement of funds from one e-wallet to another. PAYOUT Withdrawal of funds from an e-wallet to a end-user’s bank account. FEE Commission calculated and collected by the marketplace. FEE E-WALLET E-wallet owned by the marketplace to collect fees. REFUND Reimbursement to a user. KYC (Know your customer) Verification process of your users’ identity, part of European anti-money laundering regulation. CLIENT ID ID of the platform operator in MANGOPAY’s environment. USER ID ID of the end-user in MANGOPAY’s environment. DASHBOARD Personalised interface providing the platform with full access to their activity in MANGOPAY’s API. 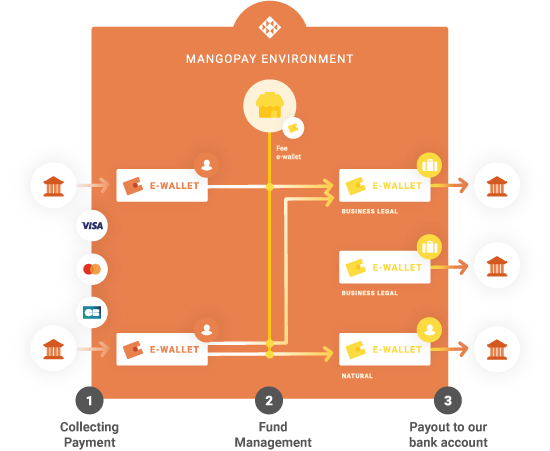 MANGOPAY is a payment solution which enables marketplaces to easily process third-party payments. The typical workflow is described below. Your first step is to register your platform and create a sandbox account. Once these steps have been completed, you will have access to MANGOPAY’s API and dashboard. Authentication is available with Basic Access Authentication. In production, we recommend using OAuth 2.0. You can find more details here. Combine the ClientId and API KEY into a string separated by a colon (e.g. "ClientId:API KEY"). Encode the resulting string using Base64. Complete the Authorization header by adding "Basic" to the encoded string. Sellers and buyers are indistinctly registered as users within the MANGOPAY API. Create sellers with the following API call. In this example, the seller is a natural user. Please refer to our documentation to create a legal user. Store the received user information, particularly the user-id, as it is required for all user actions. Use the user-id to setup an e-wallet which enables the user to store e-money. The e-wallet is owned by the respective user. Register the seller’s bank account to payout the funds from his e-wallet(s). You will need to input an existing and valid BIC/IBAN in the sandbox. European regulation requires you to create and submit seller KYC documents. Find more general information here. Find more technical information here. KYC documents uploaded to the sandbox will need to be validated on the dashboard. The process to send a KYC document is divided into 3 parts. The documents will be validated by our compliance team. Step 1: Create a KYC document with the following API call. Store MANGOPAY’s response on your side, particularly the KYCDocumentId. Step 2: Create a KYC page using the KYCDocumentId and the USER-ID. Repeat this step as many times as there are pages. The file should be encoded in base64 and grouped into one document. Step 3: Submit the KYC document for validation with the following API call. After submission, the object will be waiting to be “VALIDATED”. If you wish to be notified in case of a change of status, you can setup hook notifications. Create a buyer by repeating the seller creation process. Once again, buyers and sellers can be a natural person (natural user) or a legal entity (legal user). Create a buyer’s e-wallet by repeating the seller’s e-wallet creation process. Sellers and buyers have now been registered within our API. The next step is to send funds to a user’s e-wallet. Step 1 : Create a card registration object to store reusable and non-sensitive card details (tokens) within MANGOPAY's environment. This object is linked to the user with the USER-ID. Use these 3 parameters in the next step to post the card info. Once a token is created, complete the card registration (CardRegID) by sending the RegistrationData to MANGOPAY. The registered card may be used multiple times (one-click payment). Step 2: Process payments with the registered card via the direct pay-in. 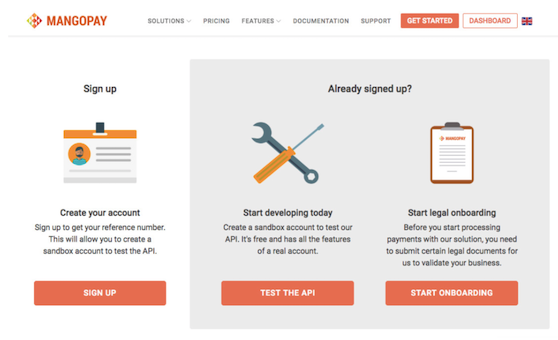 The API call contains the cardID, currency, amount (in cents), and any additional information you may want to send. As a marketplace, you may manage funds between buyers and sellers. MANGOPAY gives the possibility to refund payments, either partially or totally. Create a refund using the PAYIN-ID. A transfer request allows you to move funds from one e-wallet to another. In the marketplace flow, funds will be transferred from the buyer’s e-wallet to the seller’s. Create a transfer using the DebitedWalledID and CreditedWalletID. The marketplace can collect Fees on any transaction (pay-in, transfer, pay-out, refund). Platforms fees are automatically placed on your “Fee e-wallet”. Fees are calculated and owned by the marketplace. Find out more here. The last step of the marketplace transaction flow is the payout. Create a payout from the seller’s DebitedWalletID to the seller’s bank account. Click the Run in Postman button below to open Postman and import MANGOPAY’s API Postman collection.